This is really pretty incredible news. Most digital processing tools use someone else's RAW processor. Most of the time, it's from Adobe because many tools are designed to work as plugins for Photoshop or Lightroom. Announced today April 26 is that this summer, the folks at ON1 will be releasing their own unique offering called ON1 PHOTO RAW. A link is provided in this post and you can also read the press release below. 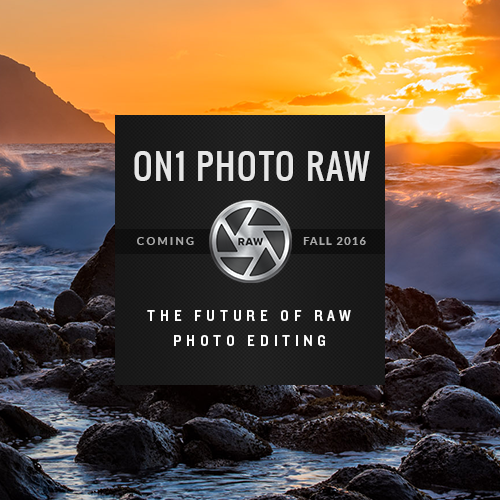 Portland, OR – April 26, 2016 – ON1, Inc. today announced ON1 Photo RAW, the first all-new RAW processor and non-destructive photo editor to be released in more than a decade. With modern code optimized for today’s super-megapixel cameras and high-performance computer graphics systems, Photo RAW will be the world’s fastest, most flexible, and easiest-to-use RAW processor and photo editor on the market when it is released this fall. Developed over the last several years, ON1 Photo RAW is built around ON1 Browse, the company’s lightning-fast photo browser, and will not require photographers to import and catalog their photos; an often painful and time-consuming process required before editing can begin. ON1 Browse is an integral part of Photo RAW, offering quick and easy ways to tag, rate, make color and tone adjustments, or add effects to their photos. Without catalogs, professionals will be able to make adjustments to photos and fellow colleagues can access and edit where they left off. This combination of a fast photo browser with instantaneous RAW processing will deliver a fluid, streamlined workflow to process any amount of photos all at once. Select one or 101 photos, make a few develop adjustments and all of the photos update automatically in real time. ON1 Photo RAW’s instruction-based, non-destructive workflow will also surpass today’s RAW processors in other key ways. In addition to customary re-editable adjustments such as exposure, contrast, color, shadows and highlights, Photo RAW will also offer non-destructive effects and portrait retouching, something not present in any photo editor on the market. The complex filters found in ON1 Effects and ON1 Portrait—including Lens Blur, Skin Retouching, Dynamic Contrast, HDR Look and many more—are all available in Photo RAW’s non-destructive workflow. The controls found throughout ON1 Photo RAW will also respond in real-time by leveraging modern video cards, using the latest versions of OpenGL and OpenCL. ON1 Photo RAW will include built-in layers, brushes, and advanced masking tools, making it a full RAW processor and complete photo editor in a single app. And, unlike any other photo app, Photo RAW will work the way you want, and where you want. For photographers with established workflows, Photo RAW will work seamlessly as a plug-in for Adobe Lightroom®, Photoshop®, and Corel®; a standalone host app for Google® Nik Collection and other photo editors; or as an extension to Apple® Photos. Common file formats—including JPEG, TIF, PSD, PSB, PND, and DNG—will be supported and will benefit from the speed and performance of the app.